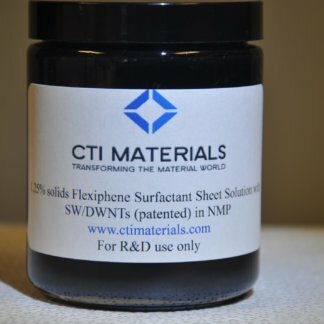 Utilize the power of graphene with CTI Material’s patented Flexiphene surfactant sheets. CTI Materials & Cheap Tubes are the only places you can buy patented Flexiphene surfactant solutions and Flexiphene dispersions of carbon nanotubes, graphenes, and other nanomaterials. Flexiphene is an amphiphilic and tunable surfactant with wide spread use in dispersions, emulsions, membranes, sensors, monolayers-Langmuir-Blodgett films, conductive and transparent conductive films, electrodes, and many other applications. 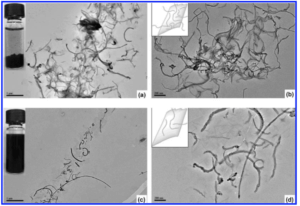 Flexiphene can colloidally disperse carbon nanotubes, graphene nanoplatelets, nanowires, and many other particles in Di Water, solvents, and other host matrixes. Our patent 10,049,783 gives us the right to commercialize this significant innovation in materials science. Research and commercial licenses are available. Flexiphene is our patented, tunable surfactant nanosheets. A novel and unique solution to your nanomaterial dispersion challenges. It provides the flexibility to tune your aqueous, organic solvent, and polymer based formulations based on pH, sheet size, and degree of reduction. Flexiphene uses the power of graphene to form colloidal dispersions of nanomaterials, including carbon nanotubes, graphene nanoplatelets, nanowires, hybrid materials and many other nanomaterial varieties in water, polymers, and solvents. These dispersions can then be processed into many intermediary products enabled by nanotechnology. Flexiphene can stabilize the solid–liquid interface. Unlike small molecular surfactants, Flexiphene sheets have a much larger lateral dimension and an array of hydrophobic, π-conjugated nanopatches in the basal plane. This allows Flexiphene to adhere to or wrap an insoluble particle with multiple adhesion sites, much like octopi capturing their prey with suction cups. Flexiphene’s performance can be tuned by adjusting the solutions pH, by the size of the surfactant sheet, and by degree of reduction giving your more precise control of your formulations. When pH is increased or Flexiphene sheet size is decreased, dispersions are more uniform because of increased edge charges and the hydrophilicity of the surfactant sheet has been increased. The charge density of Flexiphene sheets decreases with decreasing pH values, increased sheet sizes, and increased degree of reduction. Flexiphene’s amphiphilicity originates from the hydrophilic edges and hydrophobic groups in its basal plane. Smaller sheets have a higher edge-to-area ratio and are more hydrophilic than larger sheets. The size of hydrophobic nanographene regions on the basal plane of the Flexiphene sheet can be tuned by different degrees of reduction, or removal of oxygen functionalities from the sheets. Flexiphene is a surface active molecular amphiphile that can adhere to the particle-matrix interfaces in solvent, aqueous, and polymer dispersions. In aqueous dispersions, Flexiphene sheets adhere to the surface of water. Their large lateral dimensions and their presence at the air–water interface can be measured by Brewster angle microscopy (BAM). When a surface monolayer is introduced, the surface refractive index changes and allows reflection from that region. Due to Flexiphene’s colloidal particle nature, our surfactant sheets are capable of stabilizing oil–water interfaces to form particle-stabilized Pickering emulsions. 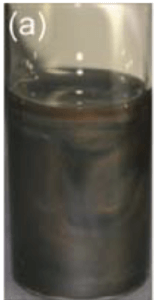 Shaking an organic solvent-Flexiphene water mixtures results in large solvent droplets in water (Fig. d). The large droplets can remain kinetically stable for many months since the Flexiphene sheets are now trapped at the oil–water interfaces. 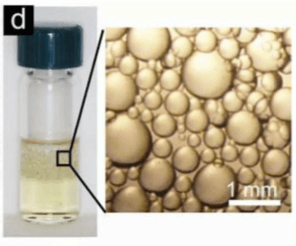 As with other particle-stabilized emulsions, Flexiphene’s droplet size is typically dependent on the colloidal concentration, with droplet sizes increasing as concentration decreases. Being a sheet-like surfactant, Flexiphene’s amphiphilicity originates from the hydrophilic edges and hydrophobic groups in its basal plane. Like ionic molecular surfactants, its amphiphilicity varies with the degree of ionization of the edge –COOH groups, or the pH of the dispersion (Fig. 5a below). Higher pH values results in increased edge charges and increased hydrophilicity of the sheet. Flexiphene’s edge-to-center arrangement of hydrophilic and hydrophobic groups allow for size variations to be a tuning parameter, too. Smaller sheets, with a higher edge-to-area ratio, are more hydrophilic (Fig. 5b below). The size of hydrophobic nanographene regions on the basal plane of the Flexiphene sheet can be tuned by different degrees of reduction, or removal of oxygen functionalities (Fig. 5c below) from the sheets. Above- TEM images of interactions formed between MWNTs and Flexiphene sheets by changing the initial proportion of MWNTs to Flexiphene sheets with 2:1 at different magnifications (a,b) and the initial proportion of MWNTs to Flexiphene sheets with 1:2 at different magnifications (c,d). The inset in (b,d) is the schematic description of the MWNT-Flexiphene complexes. One major use of surfactants is as a dispersing agent for the solution processing of insoluble solids. The surfactant behavior of Flexiphene at the air–water and oil–water interfaces stabilizes the solid–liquid interface. Unlike small molecular surfactants, Flexiphene sheets have much larger lateral dimension and an array of hydrophobic, π-conjugated nanopatches in the basal plane. Flexiphene can adhere to or even wrap an insoluble particle with multiple adhesion sites, much like octopi capturing their prey with suction cups. Flexiphene is capable of dispersing other π-conjugated materials such as organic semiconductors and conducting polymers. Amphiphilicity is a fundamental solution property of materials. Flexiphene’s amphiphilic properties enable solution processing and assembly of nanoparticles. Flexiphene can be solution-processed to form thin films by many techniques such as spin coating, drop casting, spraying, and dip coating, etc. Precise control over film thickness (i.e., number of layers) is difficult in these techniques. Flexiphene is a surfactant and we can take advantage of its surface activity and employ the classical molecular assembly methods, such as the Langmuir–Blodgett (LB) technique to create monolayers. This technique has also been used to prepare monolayers of polymers and nanomaterials. The two-dimensional water surface serves as an ideal platform to assemble GO sheets. The solvent interface is geometrically similar to Flexiphene, making it ideal to accommodate the flat sheets. The soft, fluidic “substrate” allows free movement of GO sheets upon manipulation. The surface tension of the solvent can help to keep the soft sheets flat, free from wrinkling or crumpling. Since it’s amphiphilic, it can be spread from alcohols that are miscible with water, such as methanol. When methanol droplets are gently dropped on water surface, it can first spread rapidly on the surface before mixing with water. Flexiphene surfactant sheets can be effectively trapped at the air–water interface. The density of sheets can then be continuously tuned by moving the barriers. Upon thermal or chemical reduction, Flexiphene turns into a conductive surfactant, dispersant, or stabilizing molecule with it’s own unique and desirable properties enabling numerous applications in electronic applications. Flexiphene uses the power of graphene to keep particles separated and prevent re-agglomeration. Reduced Flexiphene is a conductive stabilizing molecule. CNTs and graphene-based sheets have long been touted as promising materials for energy storage such as in ultracapacitors due to their high electrical conductivity and surface area. When used individually, both CNTs and graphene are prone to re-agglomeration which greatly limits their accessible surface area and prevents the full realization of their high specific capacitance. This problem can be solved by combining these two unique geometries—sheets and tubes—and can form CNTs-intercalated graphene stacks. Typically, the assembling strategies involve functionalizing CNT-graphene sheets with dispersing agents before mixing, which introduces very hard-to-remove impurities and removal causes defects in the final composites. The only known way to remove surfactants from a CNT or GNP film involve sequential washing with multiple solvents followed by chemical treatments with HNO3 and SOCL2. Flexiphene removes the need for these processing steps. Flexiphene’s amphiphilicity provides an immediate solution since CNT-intercalated graphene films can now be easily made by sonicating unfunctionalized CNTs with Flexiphene in water, followed by thermal or chemical reduction. The CNTs are enveloped in between adjacent Flexiphene layers serve as both spacer to prevent restacking of the sheets, and as additional electrical conduction paths can improve conductivity. The CNTs-Flexiphene hybrid can be transformed to a conductive, all-carbon composite using either thermal or chemical reduction. The reduction of Flexiphene does not generate any hard-to-remove byproducts, enabling efficient carbon–carbon interconnects in the composite. Thermal and chemical reduction also lead to gas evolution from Flexiphene, ultimately forming slightly expanded structures, in which the horizontal CNTs are now stretched along the normal direction to the sheets, forming pillars to support the hybrid structure as shown in the cross-sectional SEM images. Using Flexiphene eliminates the need for expensive and laborious material preparation methods (many of which cause defects) and will open up the possibility of preparing numerous all-carbon, carbon-rich, and hybrid materials. Liquid crystals are another important category of soft materials. It is usually made from molecules or colloids with elongated shapes, which are well oriented even in the liquid state. Since Flexiphene has an extremely high aspect ratio, it can form a liquid crystal phase. Figure a shows a dispersion with parallel sets of “swirling lines” due to anisotropic light reflection/scattering. This suggests local alignment of Flexiphene sheets. The liquid crystallinity is confirmed by a prominent optical birefringence of the solution.